Exciting news! The Insights Outlook add-in is becoming broadly available for Office 365 users. This describes the new capabilities that users will get. Did you ever miss an important email or forget a commitment you made to your co-workers? Do meetings and emails tend to take over your calendar? Do you ever wish to see reminders for 1:1 meetings with your manager, direct reports, or other top collaborators? Would you like to be notified if an upcoming meeting doesn't have a quorum? 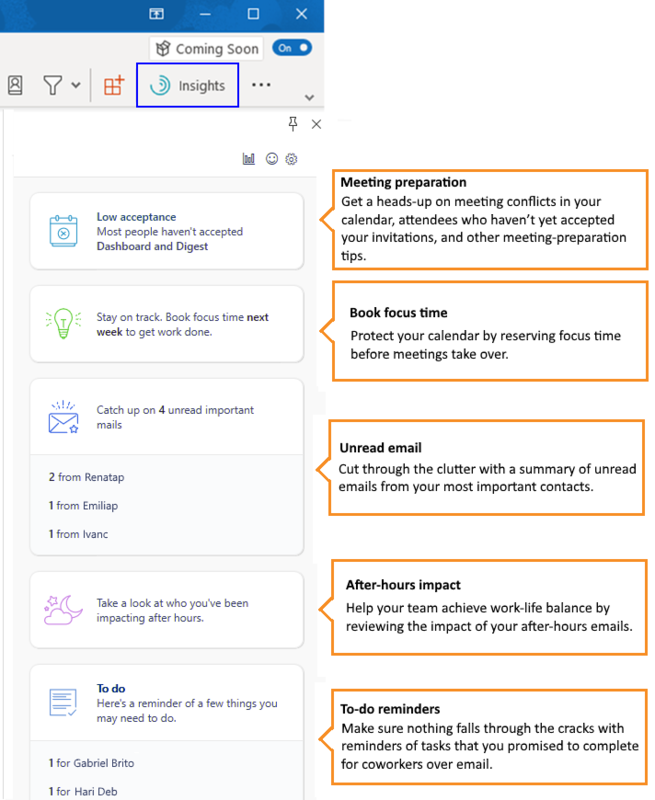 If your answer to any of these questions is yes, the Outlook add-in provides actionable insights to help you stay on top of your tasks and get more done. To open the Insights Outlook add-in, select the Insights (swirl) icon on the Outlook Home ribbon. If you are using the Outlook Web App, first open an email message and then select Insights in the top-right corner of your email message. After you launch the add-in, the Insights panel opens to the right in Outlook. The Outlook add-in preserves all the data subject rights afforded by GDPR. The insights users see in the add-in are only available to them. No admin or manager can see those insights. They are computed on the fly based on the user's email and meeting information, and are never stored outside the user's mailbox. Additionally, the add-in begins processing data for insights only when the user first launches it. Learn more about how Microsoft protects your privacy. The following answers some of the common questions asked about Insights by MyAnalytics. Q1. Which plans will offer this experience? These plans will only offer the experience that's described in this article. Additionally, users with E5 and MyAnalytics standalone service plan will continue to get the full MyAnalytics experience. Q2. What is the roll-out plan? Beginning in late February 2019, users will be assigned licenses with the MyAnalytics service enabled. The add-in functionality will begin rolling out in May 2019 to give you time to manage your settings. We will update this article after we have a precise date by which you can start to manage the MyAnalytics service for your licensed users. Learn more about license management. Q3. When will the Outlook add-in become available? Q4. Will users receive the welcome email and the MyAnalytics email digest? No. This new experience will offer only the Outlook add-in. Q5. Will users see MyAnalytics in the App launcher? Q6. Will anything change for existing users of MyAnalytics? Q7. How can I turn this off for my users? To turn this new experience off for users, you can disable access to the MyAnalytics service plan with Office 365 PowerShell.